After two weeks of extreme violence in Myanmar’s Rakhine state, where at least 400 people have been killed and 270,000 Rohingyas have fled their homes, the country’s de facto leader, Nobel laureate Aung San Suu Kyi, finally spoke up to acknowledge the crisis. But to the disappointment of several international human rights agencies, she didn’t oppose the army’s actions – and even described recent events as “a huge iceberg of misinformation” in a phone call with Turkish Prime Minister Recep Tayyip Erdoğan. This puts her at odds with a growing international consensus on what’s happening. Human Rights Watch has called the ongoing violence against the Rohingyas “ethnic cleansing” and “crimes against humanity”, while studies from Yale Law School and Queen Mary University of London have defined it as a genocide. There has been no sustained peace in Rakhine state for decades. The Rohingyas who live there have faced discrimination on the ground of their ethnicity since the late 1970s, with regular peaks of violence. So why have these conflicts repeatedly erupted despite the pleas of international human rights bodies? What are the realpolitik issues which thwart the peace process? A closer look reveals that even since its transition to democracy, Myanmar has almost zero respect and care for international norms and diplomacy. The government recently told the United Nations it will not issue visas to its inspectors seeking to investigate accusations of rights abuses in Rakhine state. It has also obstructed UN-funded World Food Program attempts to provide aid to vulnerable people. Regarding the slow response of the international community, many Rohingyas and many Bangladeshis believe that the international community is discriminatory towards Muslims and that the response would be much more serious if this level of brutality happened in any Western country. It is hard to validate such accusations. But, they may well fuel more anti-Western feelings among a large number of Muslims in the world. Among Rohingyas small groups of radical are already thought to be operating. A new insurgent group, the Arakan Rohingya Salvation Army (ARSA) reportedly attacked Myanmar police and security forces on August 25 and in October 2016. Unless the warnings by the international community are backed by a credible threat, the Myanmar government and its army, Tatmadaw will just not care. Following the eruption of the latest round of violence, Britain requested a UN Security Council meeting but China resisted stronger involvement by the UN. The issue is expected to be discussed at the General Assembly meeting in September. In March 2017, a proposed UN Security Council statement on the violence in Myanmar was blocked by China and Russia. In 2007, a UN Security Council resolution demanding an end to political repression and human rights violations in Myanmar was also vetoed by China and Russia. Chinese interests in Myanmar include a US$7.3 billion deep-sea port project as part of its ambitious One Belt, One Road plan. 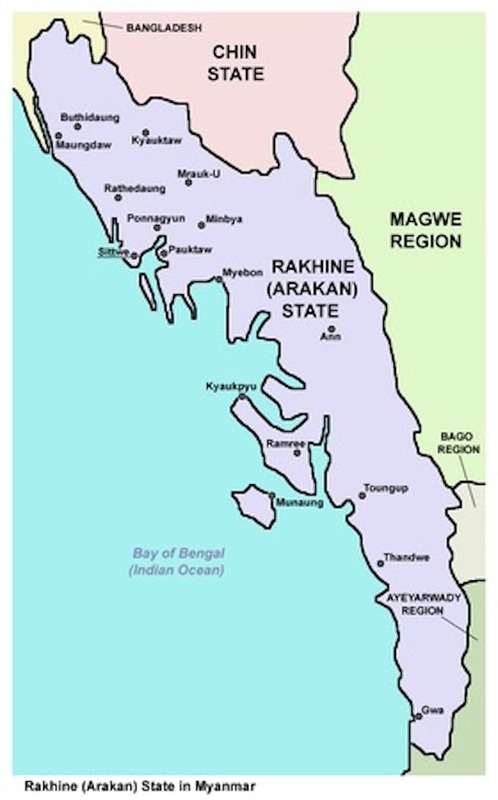 In the Rakhine state, there lies Kyauk Pyu port, an entry point for a Chinese oil and gas pipeline. India is competing with China to establish close ties in Myanmar. In July, Min Aung Hlaing, the commander-in-chief of Tatmadaw – the Burmese armed forces – visited India and met with Indian army’s chief, the prime minister, the defence minister, and the national security advisor. India, separately from its diplomatic ties with Naypyidaw, is heavily investing it the Tatmadaw via large arms exports. After the eruption of the latest violence, Indian PM Modi visited Myanmar where he clearly supported Myanmar government’s view that it is a ‘terrorist’ problem without criticising the mass killings and refugee exodus. ASEAN, the regional economic association, could potentially improve the situation in Myanmar. However, it is limited by its principle of non-interference in the internal affairs of member states. At state level, only several Muslim countries have provided strong statements against Myanmar, among them Turkey, Malaysia, Indonesia and the Maldives. Bangladesh, as the country most affected by the flow of refugees, does not show enough international engagement on the matter and can’t provide adequate protection to the refugees. Therefore, the criticisms, warnings, condemnations, and the threats struggle to cut through to the Myanmar government. The Rohingya themselves sense they will have little impact. As such, the Tatmadaw is likely to continue its brutal campaign and the frustrated Rohingyas may well become increasingly radical.